Malcolm Turnbull is happy to send children to concentration camps and happily interferes in the ABC. Australia, meet the new boss — just like the old boss, except shinier. Managing editor Dave Donovan comments. Thursday concluded the first sitting week back in Parliament for 2016, which was punctuated by the High Court ruling that, even though the Nauru Immigration Detention Centre is run by Australia, the guards wear our uniforms, and it is a key part of the Australian offshore detention policy, Australia is not really in control of the centre and is quite free to send unwanted asylum seekers there for "processing"— or what is really state sanctioned official rendition. Is it just me, or can you hear the drum of jackboots in the distance? And it appears, based on Prime Minister Malcolm Turnbull and his fish-eyed sidekick Peter Dutton's responses to questions this week, that the Australian Government will have no qualms about sending 267 refugees, including 39 children – many of whom have reportedly attempted suicide, including one five-year-old who was allegedly raped by a guard – and 33 babies back to Nauru for further "processing". Because only by "processing" refugees – and really finely processing them – will we be able to deter others from attempting to flee to our shores — that's the amoral logic, anyway. The same Turnbull that preaches passionately about the virtue of innovation, while slashing jobs at the CSIRO and destroying the NBN. "I didn't say anything to the ABC privately that I didn't say publicly." Turnbull said some pretty strong things publicly about the ABC's coverage, which is his right. It's anyone's right in a democracy. But not everyone is communications minister, with power over the ABC, including its funding. If Turnbull said the same things privately to ABC managing director Mark Scott, or other ABC executives, as he did publicly (which, of course, he has confirmed he did) in his guise as communications minister, then that is an improper use of his position for political gain. Corruption, in other words. Don't forget, Turnbull has form in this area — such as launching an inquiry into Q&A after someone he didn't approve of was allowed to ask a question on TV and calling up the SBS CEO to get a reporter sacked after he took exception to some truthtelling Anzac Day tweets. Labor are calling for an inquiry into these latest allegations. Expect more about all this in Question Time in the House of Reps next week. But don't expect to hear much in the mainstream media about it, the ABC has done just one story on Nick Ross' allegations since they surfaced a few weeks ago — an interview with Jason Clare on Thursday. This raises even more concerns about the ABC's agenda. And this is also why Independent Australia's perspective on Australian politics will be more vital than ever this election year. We'll be reapplying for Canberra Press Gallery membership later this month. It will be interesting to see what excuses they make this time. 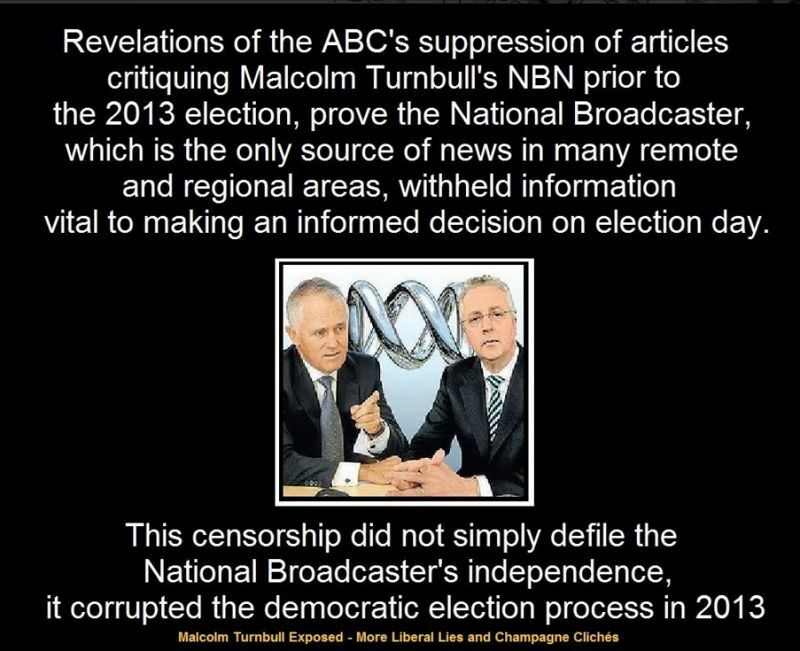 The burning issue is that if the ABC had properly reported on the NBN prior to the election the Abbott Government may not have been elected.